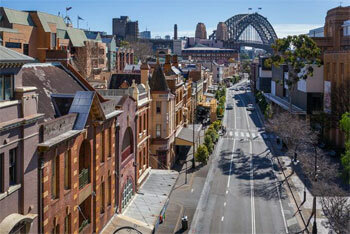 Spend a few days in Australia's iconic city of Sydney before you leave on your road trip. The Sydney Opera House and Harbour Bridge are must-sees, and you can even try climbing the Harbour Bridge for an exhilirating experience with amazing city views. Head north along the Pacific Motorway for an hour and a half before stretching your legs on the Bouddi Coastal Walk near Gosford. Weaving through Bouddi National Park , from Putty Beach to MacMasters Beach, give yourself four hours to cover this 8.5 kilometre (5.3 mile) one-way walk, with plenty of sea views, wildflowers and photo opportunities along the way. Feast on modern Italian fare (all sustainably produced and sourced) for lunch, 15 minutes north at Bombini Restaurant on Avoca Beach. For those not in the driver's seat, there's also a generous drinks list to sample on the restaurant's beautiful leafy terrace. Drive 30 minutes north to Newcastle, Australia's second-oldest city, and cool off with a swim at Nobbys Beach or historic Merewether Ocean Baths. Stay in the heart of Newcastle at the boutique Clarendon Hotel, combining modern conveniences with Art Deco design. Begin the day with breakfast at local favourite Bolton Street Pantry, tucking into dishes such as black chia pudding and brioche French toast, then explore the boutiques popping up in Newcastle, such as Willows Home Traders on Darby Street, with a seriously tempting array of homewares, and Studio Melt's unique jewellery collection. Venture roughly an hour drive inland to New South Wales’ premier wine region, the Hunter Valley. Renowned for its Semillon and Shiraz, spend the afternoon visiting some of the 120 wineries that dot the region including favourites such as picturesque Audrey Wilkinson, concert-hosting Bimbadgen and old faithful, Brokenwood Wines. Then relax, recalibrate and reconnect at Golden Door Health Retreat and its indulgent Elysia day spa. Farewell wine country with a bang: a sunrise hot air balloon ride over the Hunter Valley vineyards, followed by a gourmet breakfast at the famous Peterson House winery. Then drive 100 kilometres (62 miles) east to the sandy beaches of Port Stephens. As Australia’s dolphin-watching capital, get up close to Port Stephen’s playful residents with a morning cruise into Port Stephens-Great Lakes Marine Park, where you can jump into the water and swim with wild dolphins in their natural habitat. Then in the afternoon, explore the vast sand dunes of Stockton Beach on a quad bike. Finish the day in Nelson Bay at the recently refurbished Seabreeze Hotel, with slick nautical-inspired suites and a Santa Monica vibe. Hire a bike and start the day by pedalling eight kilometres (five miles) along the Nelson Bay to Fingal Bay cycleway. It goes through the busy marina foreshore area of Nelson Bay, along the coast and south to Fingal Bay. Switch to four wheels and buckle up for the drive 246 kilometres (153 miles) north along the Pacific Highway to Port Macquarie where you can visit the Koala Hospital, the first of its kind in the world. Continue another 160 kilometres (100 miles) north to family holiday favourite, Coffs Harbour, home to the famous Big Banana Fun Park where you can spend the afternoon going down water slides, tobogganing, ice skating or playing laser tag. Alternatively, get around town on a segway tour, which takes you along the coastline to a private beach, then up to a hilltop lookout for views over the surrounding banana plantations. Then spend the night at Pacific Marina apartments, right by the Coffs Harbour Jetty, with a swimming pool and barbecue pavilion for added fun. Spend the morning exploring the splendours of the Solitary Islands Marine Park, just off the coast from Coffs Harbour. As the third largest marine protected area in New South Wales, it spans 71,000 hectares (274 square miles) and is home to an incredibly diverse range of marine life, from coral and colourful fish to turtles and dolphins, making it an underwater wonderland for divers and snorkelers alike. Then hit the road and drive three hours north to the bustling coastal town of Ballina. Pick up fresh fish and chips for lunch and refresh with a swim at Angels Beach, one of the prettiest beaches on the north coast framed by native plants and trees. Salty and sated, drive a further 36 kilometres (22 miles) north to the bohemian beach paradise of Byron Bay. In the heart of town, check into one of the upscale holiday cottages at The Atlantic Byron Bay which is surrounded by swaying palm trees, lush gardens and a gorgeous swimming pool. Tap into Byron's chilled vibe and recalibrate with a sunrise yoga lesson at Beachside Yoga and Massage, overlooking Main Beach. Private lessons cater to different experience levels and are a great way to introduce children to yoga. Then hop in the car and drive 20 kilometres (12.4 miles) inland for a healthy, hearty breakfast from Harvest in Newrybar, one of many impressive cafes in the Byron Bay hinterland that make magic with the abundance of organic, local ingredients. Bangalow, also located in Byron's hinterland, is your next stop. Spend the afternoon exploring the joys of this quaint country township, which contains a fantastic selection of boutiques and high-end restaurants, before returning to Byron Bay. As the most eastern point of mainland Australia, take a sunrise stroll along the Cape Byron Walking Track and see the first rays of light turn the Byron Bay lighthouse pink. Then hit the road for the 90 minute drive north, over the border, to Queensland and the glitzy Gold Coast. Spend the day exploring the Gold Coast’s theme parks then try the SkyPoint Climb for an awe-inspiring adventure 270 metres (295 yards) in the air, which provides spectacular views of the lengthy beach and high-rise buildings that make up the Surfers Paradise cityscape. Check out Peppers Soul Surfers Paradise with sleek apartments, uninterrupted ocean views and all the facilities and conveniences you could dream of. Make the most of the calm waters of Surfers Paradise with a morning paddleboard lesson. After breakfast depart the Gold Coast for Queensland’s more relaxed yet sophisticated capital city, Brisbane, an easy 100 kilometre (62 mile) drive north. Spend the afternoon soaking up the city's vibrant arts scene at the Queensland Art Gallery & Gallery of Modern Art (QAGOM) in South Bank, with free entry to permanent exhibitions. There's more than 17,000 works of art including early European work, British portraiture, East Asian and European porcelain as well as contemporary art from Australian and international artists. Take a twilight adventure climb along Story Bridge for sunset views of Brisbane's skyline, then in the evening, see an outdoor performance at Riverstage before settling down for an overnight stay at the funky Tryp Fortitude Valley, Brisbane’s only street art hotel (which also has a swanky rooftop bar). After sampling the Middle Eastern-inspired breakfast menu at nearby Gerard’s Bistro (try the Baghdad eggs or spanner crab omelette), hit the highway for a 300 kilometre (186 mile) drive north to River Heads, just south of Hervey Bay. From there, catch a 50 minute ferry across to World-Heritage listed Fraser Island, the world’s largest sand island, and check into Kingfisher Bay Resort. Spend the afternoon on a whale watching cruise around the protected waters between the island and Hervey Bay, regarded as the whale watching capital of Australia. Humpbacks make their annual migration between July and November. Afterwards, cool off with a swim at Fraser Island’s vibrant blue Lake McKenzie, perched above a powdery white sand dune. Start the morning by hiking three kilometres (two miles) along the Balarrgan Circuit, which starts at the Kingfisher Bay Resort and winds through eucalypt woodland to the picturesque White Cliffs lookout. Then get the ferry transfer back to the mainland before driving one and a half hours north through vibrant sugarcane fields to Australia’s favourite rum-producing town, Bundaberg. 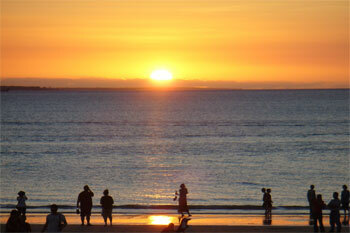 After a tour around the famous Bundaberg Rum Distillery, travel east of the city to Mon Repos Beach in time for sunset. Here you’ll find the largest loggerhead turtle rookery in the South Pacific, and evening tours that take you to protected parts of the beach to see turtles lay their eggs (November to February), or turtle hatchlings make their way to the sea (January to March). Detour 225 kilometres (140 miles) west of Bundaberg to the lush Cania Gorge National Park . Follow the 2 1/2 hour Dripping Rock walking track through eucalypt woodland and dry rainforest before reaching the base of Dripping Rock, and further on, the Overhang, where water has eroded the base of a sandstone cliff. Back on the road, follow the Burnett Highway 240 kilometres (149 miles) north to Rockhampton, the gateway to the Tropic of Capricorn. It’s here you’ll also find the "big bull" which honours the city’s reputation as Australia’s beef capital. The best place to savour Rockhampton’s most celebrated export is at the award-winning steakhouse Great Western Hotel. There’s even live bull riding every Wednesday and Friday night. From Rockhampton, drive 30 minutes north on the Bruce Highway to Capricorn Caves, an extensive network of ancient limestone caves where you can be guided on an adventure through tunnels and shafts, squeezing and crawling your way to the surface ridge for panoramic views. Afterwards, drive 30 minutes east to the charming tropical village of Yeppoon, and grab a bite to eat on the foreshore. If you're travelling with kids don't miss the Keppel Kraken Aquatic Playspace, a sculptural water play area. Rejoin the Bruce Highway and drive 350 kilometres (217 miles) north to the laid-back township of Mackay. Arrive in time for dinner at Paddock & Brew Company and enjoy craft beer with American-style comfort food and gourmet burgers. Then stay in a contemporary apartment at Riviera Mackay, in the heart of town. Continue 386 kilometres (240 miles) up the Bruce Highway, past lush mango orchards, green sugarcane fields and the "big mango" in Bowen, before arriving at Townsville for lunch. Wine and dine at The Pier restaurant, which serves local seafood and has spectacular ocean views from its tables. Then spend the afternoon exploring Reef HQ, the world’s largest living coral reef aquarium, which also features a turtle hospital. As the sun sets, stroll along the Strand, Townsville’s palm tree lined promenade, where you can drop in to a great mix of bars and restaurants for a bite to eat or drink. Later, hit nightspots such as Shaw & Co and Cactus Jack’s, before calling it a night at centrally-located Rydges Southbank Townsville. To complete the final stretch of this east coast sojourn, drive 162 kilometres (100 miles) north along the highway to Ingham, before taking an hour detour west to see Wallaman Falls, Australia’s highest single drop waterfall. Back on the highway, continue another 143 kilometres (89 miles) north before making your last pitstop at Paronella Park which was built in 1935 by José Paronella, a Spanish migrant with a taste for romantic castle architecture. Set on five hectares (12 acres) of tropical gardens beside Mena Creek, you can see the castle’s ingenious hydroelectric system, waterfall, gardens, museum and cafe. Drive the remaining 1 1/2 hours to Cairns, gateway to the Great Barrier Reef, the Daintree Rainforest, and Tropical North Queensland.